Life is NOT a popularity contest. Not everyone has to like you. In reality, only YOU have to like you. In other words, it is not the quantity of people that like you, respect you or admire you that counts. It is the quality of the relationships that you form that make all the difference. In your work as well, it is not about the quantity of new ideas you have, but obviously of the quality of those ideas that make the greatest impact. In life, we are taught that it is all a game of numbers. It isn’t. We are all here to make a mark on our world and if you can touch even just one person with your work, the quality of that work renders a deeper significance. Remember, life is not a popularity contest. Learn to not need mass approvals, validation or praise. Learn that your own validation is just enough. You do not have to change the world overnight with your concepts and thinking, you have only to believe in your work yourself and do it for all the right reasons. The rest will come in time and others will be organically drawn to you. If by your thoughts, words and actions, you inspire and change the way one person views the world, that genuine quality will encourage change on a much broader scale. 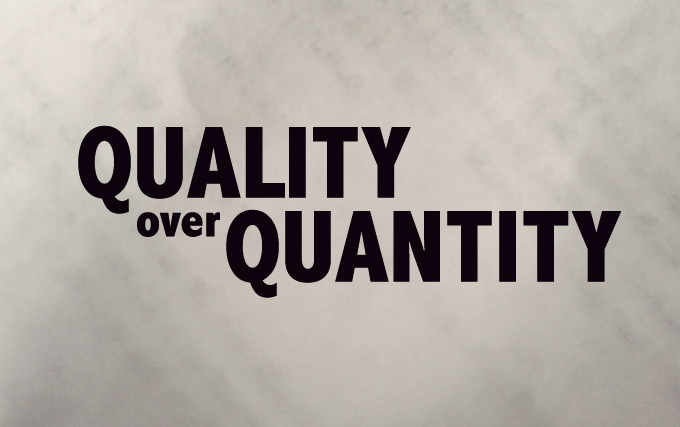 Always remember, it is about the quality never the quantity that makes you successful in life. And the quality always begins with you being true to yourself and not doing what you think is right for other people to gain their acceptance. Selling yourself out never wins you the race. But being honest with yourself promotes an integrity that is magnetic. People will be drawn to you for all the right reasons. Be a true leader. Don’t need people to follow you; follow your own heart. When you truly love yourself and live by your own highest standards, others will naturally follow suit.